While blogs continue to simmer with complaints from people who waited months to buy an iPhone and now are experiencing problems activating it, AT&T Inc. said the situation has improved. "We are working on any issues on an individual basis with customers who were impacted," said Michael Coe, a spokesman for AT&T, the Apple Inc. device's exclusive carrier. Nearly all customers have been able to activate their phones within five to eight minutes, he said Sunday. Without activation, not even the phone's alarm clock works, leading some unhappy customers to joke that their inactive iPhones are little more than expensive paperweights. AT&T attributed the problems to overloaded servers as large number of customers tried to activate their phones over the weekend. After being hit with the initial onslaught, AT&T made technical adjustments to its activation system so that new users would not face the same delays, Coe said. Customers with corporate accounts might also experience delays because AT&T needs authorization from the telecommunications manager at their company to switch them to an individual account, he said. Timothy Johnson, 36, of Collegeville, Pennsylvania, said his phone was activated Sunday afternoon, about two days after he bought it. "The experience of the activation is unacceptable," Johnson said. "It all just reeks of ill-preparedness to me." Johnson said he was happy with the iPhone and credited Apple for acknowledging the problem. But he expressed concerned about the type of service he would get from AT&T in the future. Rob Enderle, an industry analyst with The Enderle Group, said the activation problems probably won't hurt iPhone sales. "This kind of thing is not unusual when you have this number of people trying to buy something all at once," Enderle said. Depending on how the companies handle customer's complaints, it could in fact help, he said. If customers feel the company has treated them well, they are more likely to buy and recommend its products in the future. "It doesn't matter whether your product breaks or not," Enderle said. "It matters how well you treat your customers." The iPhone, which also serves as an iPod media player and a wireless Web device, went on sale Friday evening after months of anticipation. Thousands of people lined up in front of Apple and AT&T stores across the country to be among the first to get one. Apple has been updating its Web site nightly to report which of its stores have iPhones in stock. Nearly all AT&T stores have sold out, Coe said. Apple would not provide details about iPhone sales figures or customer activation problems, but a spokeswoman said the company was working hard to resolve any issues. "There are a small percentage of iPhone customers who have had a less than perfect activation experience," said Apple spokeswoman Natalie Kerris. Customers can activate the phones by logging on to Apple's iTunes software from their computers. Although many customers said they experienced no delays, others received a message saying activation "will take some additional time." Many buyers said their troubles began when they tried to switch from their current cell phone provider to AT&T. The activation problem has affected both existing AT&T wireless customers and those signing up from another cell phone carrier, Coe said. As of Sunday afternoon, eBay Inc. said more than 2,700 iPhones had been sold on the online auction site at an average price of $740.18 (EUR 548.08). 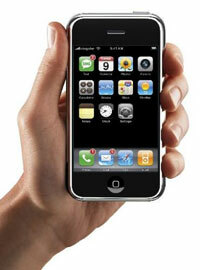 The iPhone retails for $499 (EUR 370) for the 4-gigabyte version and $599 (EUR 445) for the 8-gigabyte model.